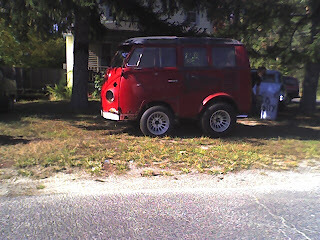 jason in jersey: Ever seen a shorty VW bus? Ever seen a shorty VW bus? This thing is freaking amazing! When Joce and I went to go eat and check out this mexican food restaurant in Lindenwold, this was right next to it. I had to stop and take a picture! I hope the guy out front didn't mind me taking a picture of it.